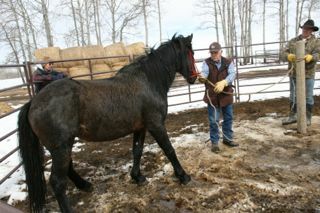 Yesterday Jack and Dan began the gentling process of the young stallion WHOAS rescued. You will remember that this boy and his family had strayed onto private property and were affecting the owners. 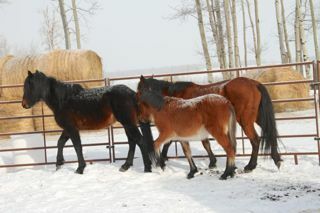 Some say that they should have just been turned loose but with this winter the mare and her foal would not have survived. Although it would be nice to have them running free, in some cases it just will not work and the better alternative is the gentling and adopting out of these horses to forever homes. 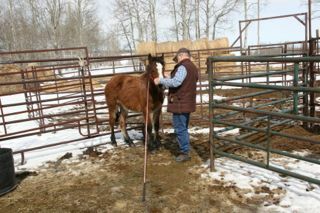 Working with a mature wild horse takes a much different approach than gentling foals. Stronger and more adverse to change, it takes an exceptional talent with lots of patience in order to at first get a halter on. It was no different with this beautiful, proud young boy. It was quite a struggle to get the halter on in the first place. Then his education began. Working with these knowledgeable horsemen who understand horse language and what it takes to gain the horse’s trust, it started. Here they are trying to convince the young man to yield to pressure and what was being done was okay. Wild horses are extremely intelligent and they learn quickly. It wasn’t long before he began to accept this. It was fascinating to watch as Jack, Dan and the boy learned about each other. As they began to touch him and get him used to this, often the horse on its own would make the first move. In this very important first lesson, all sorts of techniques using aides, including a soft bristle broom, are used to touch the horse all over to show him that everything is okay no matter where he is touched. Every lesson is ended on a very positive note so that when the next lesson begins, progress will continue. Here you can see the young stallion is resting and completely at ease at the end of his lesson. He is headed to a new home soon where he is in for a wonderful life. We will update you on this part of his journey. WHOAS’s policy corresponds with that of many horse rescue facilities in that we geld all colts and stallions before they move on. Many of you know that this will allow the horse to be handled safely under all conditions and become a better companion for its human counterparts. 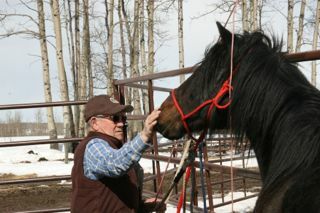 We also believe it is very important to preserve the unique genetics of our wild horses and do not agree with indiscriminate breeding. 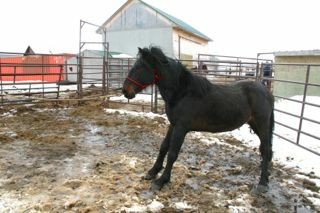 The young filly that was with the three that WHOAS rescued is also going to a new home. Her progress is moving along extremely well. 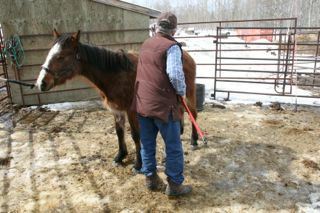 Here she calmly accepts the halter being put on. 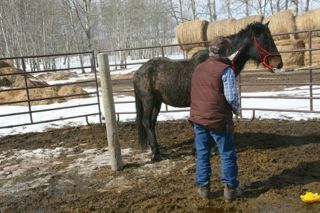 The reason the soft broom is used is for safely, both for the horse and the trainer. It also allows the horse to always know exactly where the person doing this to her is, thus keeping her more assured. Her eyes are closed as she enjoys the massage. Thanks for the update on these wildies. I totally agree with your statement on mature wildies being much more difficult to gentle. 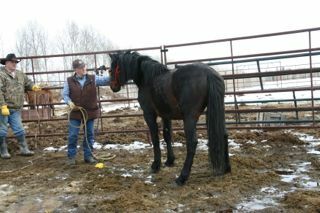 Two of my horses are wild born and came to me as 3 1/2 month old orphans. They were very easy to gentle. My current rescue was 10 months old when she came to me about 2 months ago and her gentling has been much more of a challenge, but we are slowly making positive steps in the right direction. I live in Southern BC and we currently don’t have any societies like WHOAS here. 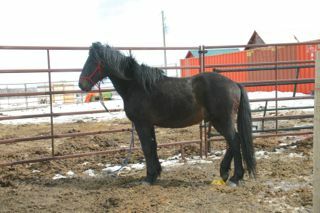 I am looking for help to find a home for this filly. She is a nicely put together, stunning red dun (maybe a dunalino). I have pictures of her lovely grulla pinto dam and her sorrel sire too.